Unist’tot’en camp members stop surveyors, November 2012. Grand Chief Stewart Phillip of the Union of BC Indian Chiefs says RCMP officers have booked up hotel rooms in Burns Lake and Smithers, a firm indication of plans to invade the Unist’ot’en Camp in northwestern B.C. Police officers have booked up hotel rooms in Smithers and Burns Lake in preparation for an invasion of the Unist’ot’en Camp, said Grand Chief Stewart Phillip of the Union of BC Indian Chiefs. The news came in this morning, said Phillip, confirming what have previously been thought to be rumours of an impending “mass arrest operation” on traditional Unist’ot’en territory in northwestern B.C. The Unist’ot’en Camp recently gained major media attention for refusing to allow oil and gas companies to access its land, and denying entry to pipeline officials at the checkpoints it maintains on Moricewest Forest Service Road and Chisolm Road. More than 400 individuals and organizations have now signed an online declaration of support for the Indigenous group, up from just over 50 yesterday, when word of an RCMP operation started circulating. “I don’t want to disclose names, but there have been top political leaders who have contacted senior levels of the RCMP again, attempting to persuade them to stand down,” said Phillip, who will be heading to the Unist’ot’en Camp on Sunday to support its residents and bear witness to any police action that may take place. Phillip confirmed that RCMP have indicated that “they really want to keep the peace,” but these statements seem to contradict the evidence on the ground. He said the Unist’ot’en Camp members have spotted what they believe to be two RCMP campsites near the Indigenous residence, likely being prepared to serve as a base of operations for officers and equipment. A dispute over energy projects and aboriginal rights is heating up at a pipeline protest camp in northern B.C. where First Nations leaders fear police are planning mass arrests. Shell’s TransCanada Coastal GasLink pipeline project. Shell plans to build a 650-kilometre pipeline from B.C.’s gas-fracking region to a proposed LNG site in Kitimat. Spokeswoman Shela Shapiro told CBC News the company supports the right to peaceful protest, but called the RCMP after Unist’ot’en protesters prevented workers from using a public road on Thursday. The camp is about a two-hour drive southwest of Houston, B.C. on rough forest roads. Yesterday afternoon, the Unist’ot’en Camp posted a message on its Facebook page. Shapiro told CBC that TransCanada is “absolutely willing” to work with camp leaders, saying the company has made more than 90 attempts to speak with the hereditary chief and Unist’ot’en spokesperson. The Unist’ot’en camp calls itself a “non-violent occupation” of traditional aboriginal land. Unist’ot’en camp protesters routinely stop traffic on remote forest service roads near the camp and turn back oil and gas crews. Companies trying to use the area say they’re trying to use public roads to access Crown land, and some have ferried their crews to nearby worksites by helicopter. Now, the Union of B.C. Indian Chiefs says top RCMP officials have told them a major police crackdown is imminent. Phillip said he doesn’t know why RCMP want to act now. He said the camp has been operating for several years and that low oil and gas prices mean some of the energy projects proposed for the area might be shelved. Bill C-51, the Anti-terrorism Act enacted by the federal government in 2015, has been criticized by opponents for the expanded powers it gives the police and the Canadian Security Intelligence Service. In an email to CBC News, RCMP E-Division Cpl. Janelle Shoihet said RCMP do not provide details about the number of police required or deployed in operation. 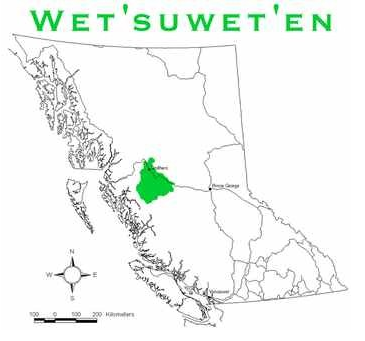 She said there has been “no police action to date,” and that discussions between industry and the Wet’suwet’en are still possible. CBC News has learned of a larger RCMP presence in Smithers, Burns Lake and Houston, the towns closest to the protest camp. Posted on August 28, 2015, in Oil & Gas and tagged anti-pipeline resistance, Coastal GasLink pipeline, oil and gas pipelines+Indigenous resistance, RCMP, Royal Canadian Mounted Police, TransCanada, Unis’tot’en, Wet'suwet'en. Bookmark the permalink. 7 Comments. This will not end well for the colonizing settlers if they attack indigenous people in our own territories! A wrong move in this situation could result in large numbers of settlers paying a heavy price for their arrogance! It’s really telling when they say that the energy companies and the unistoten are in some sort of discussion. From everything I have read, they are NOT in discussions with them and as this article states — they have visited the unistoten camp over 90 times…trying to intimidate and harass them. “All warfare is based on deception,” Sun Tzu.